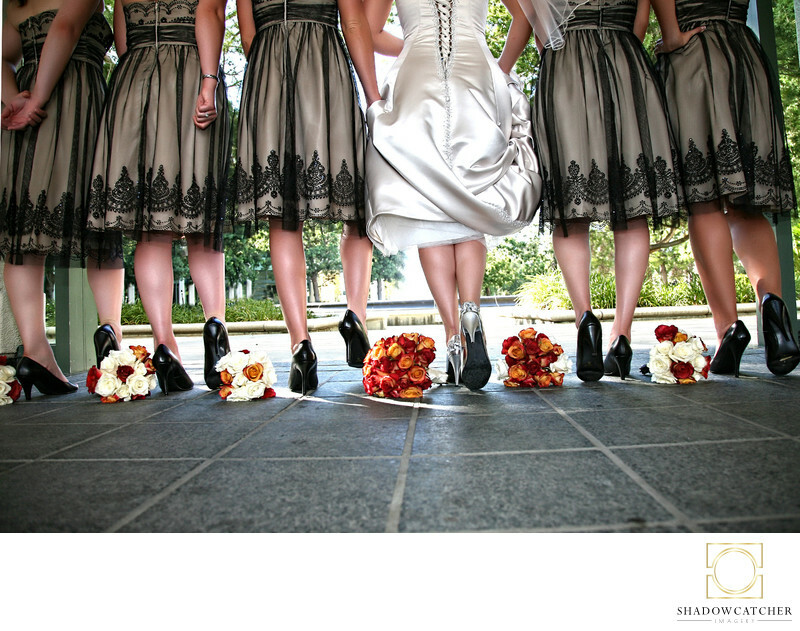 This fun image of a bride and her bridesmaids walking away is one of our favorites. As wedding photographers in San Diego, every weekend provides us with excellent opportunities to capture beautiful and creative wedding images for our clients. This image comes to life with the super cute bridesmaids dresses, all in a light taupe/gray color. Since this wedding was in the fall, the bridesmaids all had beautiful bouquets with orange and rust colored flowers, the brides bouquet was rich in orange and rust colors as well. On the wedding day, our photo team splits in half. Heather is with the Bride and her Bridesmaids, while Skip is with the Groom and Groomsmen. The brides almost always want to do photos with their shoes, and Heather is always happy to find a new and creative way to showcase those gorgeous wedding shoes! This wedding, at the California Center for the Arts was filled with fun and laughter. The California Center For the Arts in Escondido has listed us as their preferred photographer, and our team is thrilled! The California Center for the Arts, Escondido is situated on a 12-acre campus in downtown Escondido adjacent to Escondido City Hall and Grape Day Park. The campus is comprised of a 1,523-seat Concert Hall, a 406-seat Center Theater, a visual arts Museum, art and dance studios, and a Conference Center containing meeting and banquet facilities. Groundbreaking occurred on June 22, 1991. Since its opening on October 1, 1994, The Center has attracted more than one-million visitors through its performing and visual arts presentations, events in the Conference Center, and education programs.